Summary: From New York Times bestselling novelist Joshilyn Jackson comes an e-original short story that gives a fierce and funny character from Someone Else's Love Story a standalone adventure all her own. Shandi Pierce got pregnant when she was only seventeen years old. She fell for her son—deeply, instantly, completely—but as she sat at the table feeding him, her own mother was sliding eggs and bacon onto her plate, feeding her. One of my highlights from this year's BEA was meeting Joshilyn Jackson. I have loved this woman's writing ever since my book club read GODS IN ALABAMA almost ten years ago. I have anxiously awaited each one of her new books, and I was extremely excited to learn that she has a new novel called SOMEONE ELSE'S LOVE STORY which will be available in just a few weeks! Ms. Jackson was the surprise guest at an event held at the Harper Collins' offices during the week of BEA, and she was exactly how I imagined her to be. She was full of life and totally hilarious, and if nothing else, she convinced me that I need to "listen" to one of her books in the very near future. (She narrates her own audiobooks -- how cool is that?) 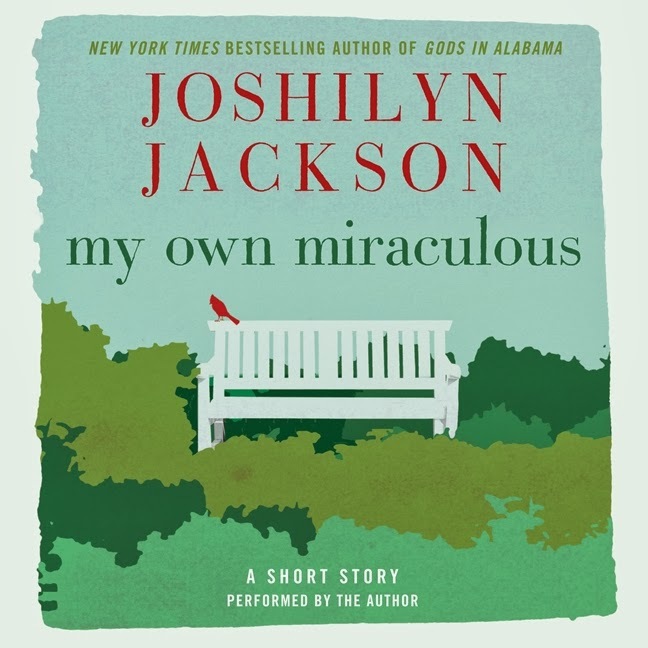 Well, that opportunity came to me a few weeks ago when I received an audio copy of her new short story MY OWN MIRACULOUS. MY OWN MIRACULOUS features one of the characters in SOMEONE ELSE'S LOVE STORY named Shandi Pierce. Shandi finds herself pregnant at seventeen and isn't quite ready to be a mother at this young age. She loves her son from the moment he is born and does her best to mother him, but she still needs a lot of help from her mom. Shandi's son Natty is now four and Shandi is discovering that Natty is "special." He is attracting the attention of a strange girl who feels a connection to Natty. Shandi wants to protect Natty at all costs, and in the process, she has to grow up and become a mother in her own right. MY OWN MIRACULOUS was a terrific listen. I definitely enjoyed the story and the characters, and I look forward to learning more about Shandi in SOMEONE ELSE'S LOVE STORY. This sweet short story had a little bit of everything including humor and even a little mystery that kept me guessing. But I especially appreciated how it celebrated friendship, family, and motherhood. 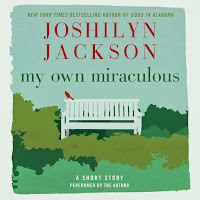 Joshilyn Jackson read MY OWN MIRACULOUS and it was everything I hoped it to be. She not only has mad writing skills, but she's also a darn good audiobook narrator. I loved her voices and her inflections, and that Southern accent is too cute! MY OWN MIRACULOUS was exactly what I needed during my morning workouts. It was a cute short story that left me wanting more. Good thing SOMEONE ELSE'S LOVE STORY comes out in just a few weeks! I loved the story and Jackson's narration too! Now I know why Sandy only listens to Jackson's books. I absolutely love JJ...SO MUCH. Everything she writes just exudes her personality (and isn't she larger than life?). I am very excited about this audio and her new one...which, as Kathy said, I will ONLY listen to on audio. That is the only way to experience her work I think! I've never listened to Joshilyn on audio, but I think its about time that I did! I too have only listened to her books -- even the early ones when she didn't do her own narration. Like you, I've been a fan since her first book came out. Sandy and Joshilyn herself were the two who encouraged me to listen to audio, it was when A GROWN UP KIND OF PRETTY was new,and I dumped my print for audio and then started at the beginning and I've never looked back. She is a southern star in my books in audio and print!! I was just listening to the short. It's so good! !